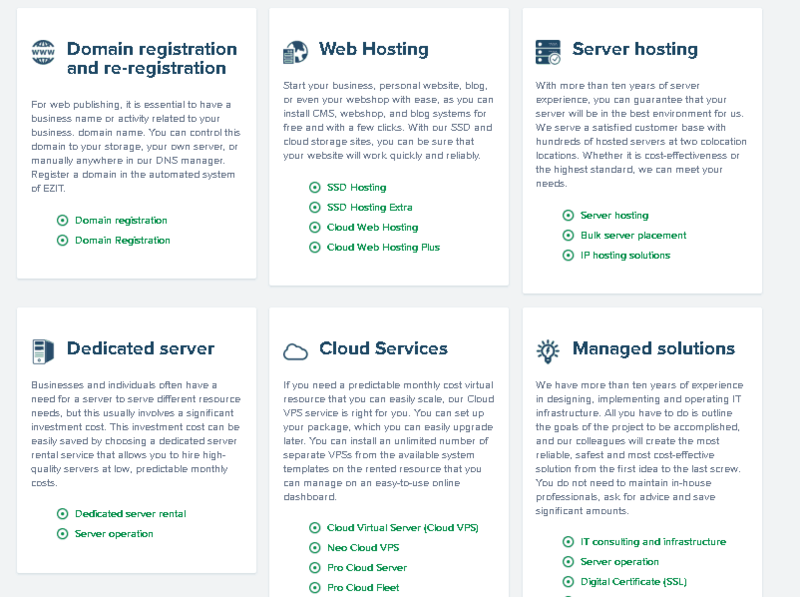 EZIT Review 2019: Is EZIT a Good Hosting? EZIT is a Hungarian based website hosting provider offering a full suite of services. Their shared hosting packages are very comprehensive and use top quality hardware. Founded in 1996, EZIT is a veteran in the website hosting world. They are a Hungarian-based company that owns and operate over 500 servers. They have a team of industry experts working 24/7 to provide top quality website hosting for their customers. Their website and support are in Hungarian only. EZIT offers a comprehensive series of website hosting packages. They offer shared website hosting, dedicated server rental, cloud virtual private servers, domain registration, and SSL certificates, as well as many auxiliary services such as IT consulting, marketing services, and webmaster services. EZIT has a really easy to use website. Although they sell a huge number of packages tailored to all sorts of budgets and business sizes, they manage to convey their services very concisely. Instead of using any misleading “unlimited” terminology, they clearly detail the inclusions. For example, their base package includes 1GB SSD storage, a free SSL certificate, unlimited domains, and up to 30,000 monthly visitors. They also have a clearly outlined uptime SLA with a credible uptime of 99.9%. They own and operate two server rooms, which house over 500 servers inside a larger data center located in Hungary. They use 100% SSD storage for faster disk read times with far smaller risk of breakage, as well as RAID 1 and RAID 10 redundant data storage. They also have uninterruptible power supplies and premium servers brands including Dell PowerEdge and Supermicro. For advanced users, they offer support for PHP versions 4.4 through 7.1, which is much faster than a lot of companies who only offer PHP version 5, as well as SQLite 3 database, unlimited databases, and built-in phpMyAdmin. The pricing page is quite hard to understand as they switch between currencies on the checkout page. However, the prices are quite good once you’ve figured them out. They offer their prices in one, six, twelve, twenty-four, and thirty-six month terms. The prices do decrease quite significantly if you purchase a longer term. A couple of considerations, VAT and domain registration are charged on top, whilst SSL certificates are included in the price. They have 24-hour customer service which is available via telephone, email, and live chat, although the live chat button is quite hard to find on their website! They have a detailed knowledge base available on their website, which again is hard to find, but is very useful once you do. Their customer service is 100% Hungarian and they are very helpful and well-informed. EZIT is a full service website hosting company. With over ten years of experience, they are a team of industry experts who know their stuff. As well as offering small plans for new and small website owners, they offer comprehensive packages for larger scale businesses with cloud website hosting packages that can accommodate up to 500,000 website visitors per month. Wondering how EZIT stacks up against other Web Hosting companies? Enter any other Web Hosting company and we will give you a side-by-side comparison.